Whilst walking through the Exeter Princesshay Shopping Centre today I came across this large steel sculpture of a head and hands reaching for the sky. Titled ‘Only Hope Remains’ by Exeter artist Simon Ruscoe, the exhibit will be positioned within the Bedford square for a few weeks over the Easter break. On Friday 29th March, a 20 foot steel sculpture appeared unannounced and overnight in Princesshay’s main square. Exeter born artist Simon Ruscoe’s sculpture, Only Hope Remains, is set to amaze shoppers in the city for two weeks during the Easter holidays. In 2004 Ruscoe embarked on the creation of a massive collective sculpture with the ambition of seeing it on permanent display in the city; the work is now almost complete. 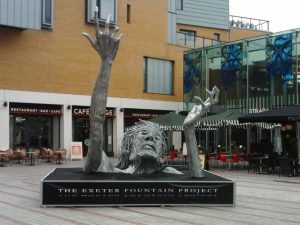 The sculpture on display in Princesshay is one of seven steel figures, some over twenty feet in height, struggling to stay above an imaginary waterline which Ruscoe labels The Exeter Fountain Project. These incredible sculptures are made up of over ten thousand pieces of metal, each one cut by the artist’s hand. Ruscoe’s vision is that the figures be situated in water to create stunning reflections that could be floodlit to achieve maximum impact. People may also be aware of other sculptures by Simon Ruscoe in Exeter. His metal unicorn is situated adjacent to the Phoenix Arts Centre and the University of Exeter recently commissioned sculptures by him. Apart from working as a sculptor, he has funded the entire project himself working as a cleaner, a hospital porter and a technician in a number of Devon Galleries and Universities. Following the exhibition in Princesshay, Simon is looking for an organisation or an individual with the vision and passion to help either with promotion or citing the work. Perhaps a landowner who would allow him to exhibit one or more of the figures in a prominent place so that he can gain support and interest for this thought provoking and spectacular sculpture. I don’t know what you think but I for one would love to see some of these magnificent designs permanently sited around the city! The blog ‘Image of Exeter’ is no longer online.